Q&A: Can I Get the Flu From a Flu Shot? Question: I once got a flu shot and then came down with the flu afterward. Now I won’t get the shot anymore. Why did the shot give me the flu? We’ve received a number of questions and concerns about the swine flu and the H1N1 vaccine. 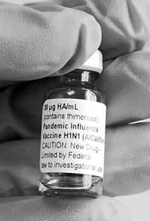 Indeed, a new survey by the Harvard School of Public Health finds that six in ten adults are not “absolutely certain” they will get the H1N1 vaccine, citing concerns over side effects, lack of perceived risk and belief that they could receive medication if they do get sick . Just over half of parents surveyed report being “absolutely certain” they well get the vaccine for their children. To help disseminate credible information on the H1N1 vaccine and provide additional sources for review, we’ve put together a list of questions and answers addressing what you need to know about the H1N1 vaccine.